Frosted Beans: Should I Replant? Some Mid-April Planted Corn in Trouble. Moth captures are very low this spring. Few weather fronts have originated from the Southwest this season. Early tillage and planting this sring have eliminated weedy egg-laying sites. Scouting is the only way to know if cutworm are present and damaging the crop. Black cutworm pheromone trap cooperators continue to faithfully report their week’s catches, but most are certain that something is wrong. Refer to this week’s trap report and see very few captures; that has been the case throughout the spring. Comparing moth captures from the previous four years, see graph, it is obvious that black cutworm moth arrival into Indiana has almost been non-existent. Not only Indiana, but abnormally low moth captures have been reported throughout the Midwest. This certainly has not been a “normal” year for weather patterns. Normally, moist (i.e., rain) air currents sweeping up from the Gulf States, Texas, and Mexico (i.e., warm) literally lift these moths into the upper atmosphere and carry them into the Midwest. The direction that these weather systems move and the number of moths captured soon afterward give us an idea of when and how much black cutworm damage will occur. Obviously, this is not an exact science, considering all the possible errors with traps numbers, etc., but it has worked nicely in the past. Checking weather (Indiana Climate Page) from mid-March to present, indicates only 6 days with surface wind directions from the Southwest coupled with moderate air temperatures. Obviously, with the cool temperatures of late, much of our weather influence has come from the north. Also, tillage and planting conditions this spring have eliminated many weedy fields that attract moth egg laying. So, what few moths that have arrived into the state, have not experienced Hoosier Hospitality this spring. Will there be any black cutworm damage to corn this spring? Troy Jenkins, Fulton-Marshall County Coop, is one of our pheromone cooperators that hasn’t caught any moths but has reported some larval damage to corn within miles of his trap. Again, moth trapping and damage predictions is not perfect. We continue to advocate scouting in those emerging fields to “ground truth” the science. Because replanted corn will be late to pollinate compared to most neighboring fields, second-generation corn borer moths (European and/or Southwestern) will be attracted to these fields for egg-laying. If producers have an option in seed selection, they may consider using Bt for corn borer in their replanted acres. This “built-in” protection may protect yield and reduce harvest losses from later-season corn borer damage. 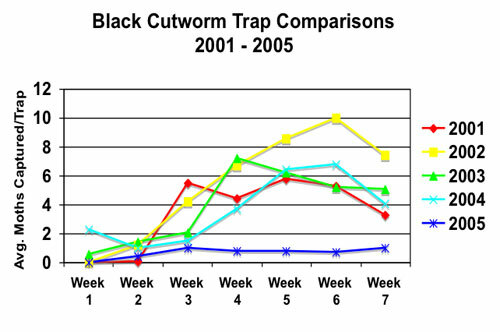 Black Cutworm Adult Pheromone Trap Report. 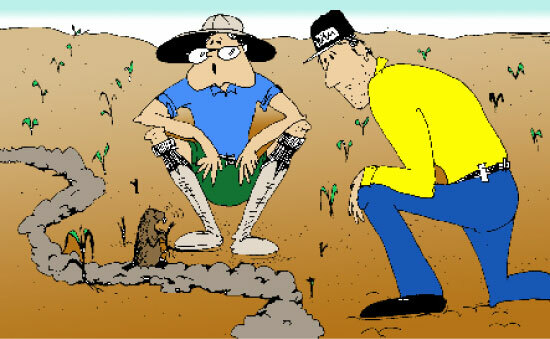 "I didn't think it was cutworm damage!" We have just completed screening of horseweed (marestail) seed samples collected in the fall of 2004 for tolerance to glyphosate. The purpose of this article is to briefly summarize the methods used in this process and show the newest counties which have documented populations of glyphosate-resistant horseweed. This project is a three-year process in which we will intensively sample 48 of Indiana’s 92 counties for the presence of glyphosate-resistant horseweed. We initiated the project in 2003 with the idea that we would sample 16 counties each year. In each county surveyed, twenty to forty randomly predetermined GPS coordinates are selected with a mapping software program. When we arrive at the coordinate, we drive to the first soybean field after the coordinate. We enter the field and look for horseweed seed heads protruding through the soybean canopy. If horseweed is found, seed heads are collected from 40 plants and placed in a container for transport back to campus. The seed heads are composited for an individual field and seed is removed from the plant, cleaned and kept separate from other seed sources. When we are ready to screen the samples, a small volume of seed is planted into a large flat and after several hundred plants emerge, 12 individual plants are transplanted into smaller flats. Table 1. New counties in Indiana where glyphosate-resistant horseweed was found in the 2004 glyphosate-resistant horseweed survey. of escaped horseweed in soybean fields in the regions sampled in 2004 is much lower than the region sampled in 2003, which included 10 counties in southeast Indiana and 6 other counties spread throughout Indiana. In 2003, we found escaped horseweed in about 390 out of 780 sites sampled (roughly 1 out of every 2 sites sampled). In 2004, we sampled 16 counties in an area from Evansville north to Crawfordsville, then east to Richmond. Escaped horseweed was found at roughly 1 out of every 6 sites or about 60 out of 360 sites sampled. Management of this weed in soybean will continue to be an issue for growers in these areas to consider when planning their weed management program. At this point in the season, if soybeans are already planted and you suspect you have glyphoste-resistant horseweed, the only effective in-crop control options would be tankmixes of glyphosate with Classic or FirstRate. We have screened several of the 2003 populations for tolerance to ALS inhibitors such as Classic and FirstRate. To date, we have found that about 20% of the populations that are resistant to glyphosate are also resistant to Classic or FirstRate. Conversely, we have found that about 1/3rd of the populations that were not resistant to glyphosate, but were resistant to Classic or FirstRate. The good news is that ALS resistance has been found in relatively low percentages of glyphosate-resistant populations, but appears to be more prevalent in populations that are not glyphosate-resistant. Our glyphosate-resistant horseweed research and extension efforts are supported the Indiana Soybean Board, USDA’s Critical and Emerging Pest Program, Monsanto, Syngenta, BASF, Valent, Dupont, Dow AgroSciences, and Bayer. There have been a few reported cases of early planted soybean fields that were frosted in last week’s cold temperatures. As growers and industry inspect these fields it is critical to identify which plants are living and which plants most likely will die due to this damage. In soybean once the cotyledons emerge from the soil, the growing point is above the ground and exposed to the environment. Soybean can withstand temperatures down to 28°F; unfortunately there were several areas around the state last week that were at or below this temperature threshold. When inspecting a soybean plant for crop injury first inspect the hypocotyl region (area above ground but below the cotyledons). If the hypocotyl region is water soaked or discolored that plant is dead (Image 1). 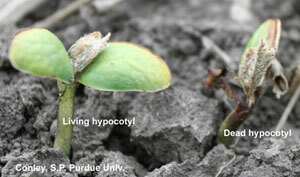 If the hypocotyl and cotyledons remain green, but the unifoliate leaves appear dead the plant most likely will remain alive. 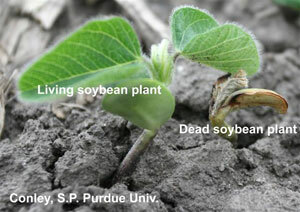 Soybean axillary buds develop at each leaf axil, including the cotyledon axil, if this region remains alive soybean growth will continue. Before making the decision to replant remember to scout the entire field. Subtle difference in microenvironments across the field will dictate the extent of stand loss (Image 2) especially when the temperature was so close to the injury temperature threshold of 28°F. Also remember that soybean is an extremely resilient crop. Purdue University research indicates that soybean stand populations of 80,000 plants per acre will yield 96 and 100% of maximum yield in 7.5 and 30” rows, respectively. With weed management tools such as Roundup Ready Soybean and the ever increasing price in seed it may prove economical to keep the reduced soybean stand and mange it accordingly. Fields planted mid-April that experienced not only cold temperatures, but also significant rainfall (2 to 4 inches) during the latter part of April may suffer significant stand loss due to seedling disease development. Suspect fields should be inspected throughout this coming week; especially lower lying areas where saturated soils were more prevalent in the last couple weeks. 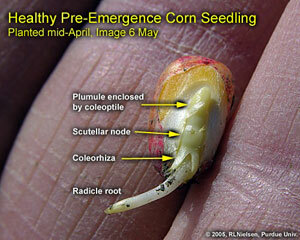 A healthy pre-emergence corn seedling. 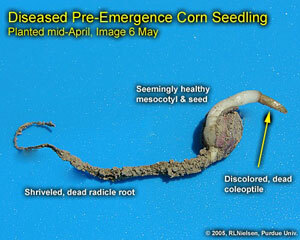 Pre-emergence corn seedling with visual symptoms of seedling disease. I visited a number of fields in east central Indiana Friday afternoon that had not yet emerged even though the calendar was approaching three weeks since they had been planted. More importantly, apparent seedling disease development in these fields was widespread and eventual stand establishment may be poor enough to merit replanting. The common combination of factors among these fields was mid-April planting (5 to 6 days prior to the recent cold snap) followed by the onset of cold soils (too cool to sustain germination), heavy rainfall, short-term ponding, saturated surface soils, surface soil crusts, and (eventually) seedling diseases. 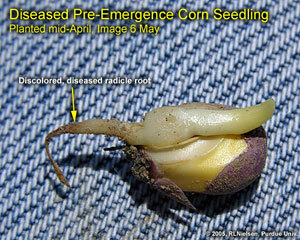 Plant pathologists often remind us that one of the consequences of cold wet soils, delayed corn emergence, and slow seedling growth is the higher risk of seedling disease development as the seed-applied fungicides slowly deteriorate following the first two to three weeks after planting (Malvick, 2005; Robertson, 2005; Thomison & Lipps, 2005). Indeed, one of the common denominators among most of the pre-emergence seedlings I looked at last Friday was a discoloration and/or outright death of the radicle root, coleoptile, or scutellar node symptomatic of seedling disease development. Growers should visit fields not yet emerged or recently emerged and carefully inspect seedlings for symptoms of disease; especially lower lying areas where saturated soils were more prevalent. A decision to replant based on inspections of pre-emergence seedlings can be difficult primarily because most of us don’t have the patience nor the time to thoroughly sample a field on our hands and knees digging up seedlings. The consequences of seedling disease on the success of emergence and initial stand establishment will become more apparent by the end of this week, if not sooner. Once emergence occurs (or not), growers will be able to more easily assess healthy plant populations and make a replant determination. Remember to use my replant worksheet (Nielsen, 2003) to help estimate the yield and dollar returns to replanting if the economics of the decision are not obvious. Malvick, Dean. 2005. 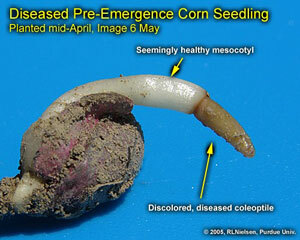 Corn Seed and Seedling Diseases. Illinois Pest & Crop Bulletin. Univ. of Illinois. Available online at www.ipm.uiuc.edu/bulletin/article.php? Nafziger, Emerson. 2005. The Good, the Bad, and the Unsightly. Illinois Pest & Crop Bulletin. Univ. of Illinois. Available online at www.ipm.uiuc.edu/bulletin/article.php? Nielsen, R.L. (Bob). 2003. Estimating Yield and Dollar Returns from Corn Replanting. Purdue Univ. Cooperative Ext. Service Publication AY-264-W. Available online at www.agry.purdue.edu/ext/pubs/AY-264-W.pdf [URL verified 4/28/05]. Robertson, Alison. 2005. 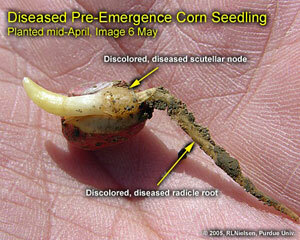 Cool temperatures favor corn seedling diseases. Iowa Integrated Crop Management Newsletter. Iowa State Univ. Available online at www.ipm.iastate.edu/ipm/icm/2005/5-2-2005/cool.html [URL verified 5/8/05]. Thomison, Peter and Patrick Lipps. 2005. Impact of Freezing Temperatures and Snow on Corn Survival. Crop Observation Reporting Network, Ohio State Univ. Available online at http://corn.osu.edu/index.php?setissueID=80#D [URL verified 4/29/05]. For other Corny News Network articles, browse through the CNN Archives at www.kingcorn.org/news/archive.html. For other information about corn, take a look at the Corn Growers’ Guidebook at www.kingcorn.org.